So you are “Eastern Orthodox”? 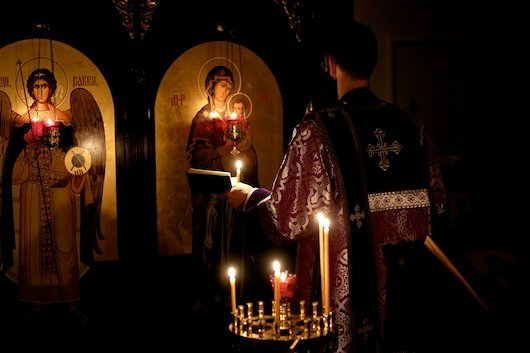 Are you “Greek Orthodox” or “Russian Orthodox”? I only know of two kinds of Christians, Protestant and Catholic. How can you claim you are neither? Why do you call yourselves “Orthodox”? Do you follow the Bible or Tradition? Are you saying that your elaborate worship is based on the Bible? I’d like to know where. It sounds as if you are rigidly bound by your Tradition. You mean it can’t change? Why do you have all those pictures in your church? Don’t you think your old-fashioned doctrine and worship a bit irrelevant to modern American life? Yes, except that we as predominantly Americans are quite “Western.” Ironically it was actually from the West that the “Eastern Orthodox Church” came to these shores some two hundred years ago – through Alaska and California. Since that time Orthodox Christianity has been flourishing in the Americas. Also worth noting is that original Christianity was not a “Western religion” at all, but emerged from the near East – Palestine and Asia Minor. The Orthodox Church is One Church. Currently, however, Church organization in North America is divided among several different “jurisdictions,” or governing bodies of varying national origin within the One Church. The doctrine and worship of each jurisdiction and parish is the same, though in some, languages other than English continue to be used in the services. 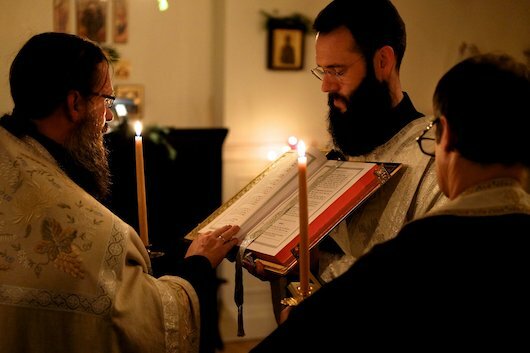 Russian, Greek, Serbian, Antiochian – it is all in reality one and the same Orthodox Church.Our particular parish is part of the Orthodox Church in America (OCA), which historically emerged from the Russian Orthodox Church. From the Orthodox point of view, Roman Catholicism is an early medieval modification of the original Orthodoxy of the Church in Western Europe, and Protestantism is a later attempt to return to the original Faith. To our way of thinking, however, the Reformation did not go far enough. We respectfully differ with Roman Catholicism on the questions of papal authority, the nature of the Church, the approach to salvation, and a number of other consequent issues. Historically, the Orthodox Church is both “pre-Protestant” and “pre-Roman Catholic” in the sense that many modern Roman Catholic teachings were developed much later in Christian history. Many of the “polarities” between Protestants and the Roman Communion (i.e., “Word versus Sacrament,” “Faith versus Works” or “Symbol versus Reality”) have never arisen in the Orthodox Church. The word orthodox was coined by the ancient Christian Fathers of the Church, the name traditionally given to the Christian writers in the first centuries of Christian history. Orthodox is a combination of two Greek words, orthos and doxa. The Orthodox Church today is the same as the undivided Church in ancient times. The Protestant Reformer Martin Luther once remarked that he believed the pure Faith of primitive Christianity is to be found in the Orthodox Church. On seven major occasions during the first millenium of Christianity, the leaders of the worldwide Church; from Britain to Ethiopia, from Spain and Italy to Arabia and Asia, met to settle crucial issues of Faith. The Orthodox Church is highly “conservative” in the sense that we have not added to or subtracted from any of the teachings of those Ecumenical Councils. But that very “conservatism” often makes us “liberal” in certain questions of civil liberties, social justice and peace. We are very conservative, or rather traditional, in our liturgical worship. A good short answer to this question is “Yes!” The question implies precisely a kind of polarity (i.e., “Bible versus Tradition”) which is not part of the Orthodox Christian worldview. Tradition means “that which is handed over.” The New Testament carefully distinguishes between “traditions of men” and Holy Tradition, which is the Faith handed over to us by Christ in the Holy Spirit. That same Faith was believed and practiced several decades before the New Testament Scriptures were set down in writing and given canonical (i.e., official) status. We experience the Tradition as timeless and ever timely, ancient and ever new. We distinguish between Holy Tradition (“with a capital T”) which is the Faith/Practice of the Undivided Church, and traditions (“with a little t”) which are local or national customs. Due to changing circumstances, sometimes cherished customs must be altered or respectfully laid aside for the sake of Holy Tradition. The New Testament Scriptures are the primary written witness to Holy Tradition. Orthodox Christians therefore believe that the Bible, as the inspired Holy Scriptures, is the heart of the Tradition. In the New Testament all basic Orthodox doctrine and sacramental practice is either specifically set forth, or alluded to as already a practice of the Church in the first century A.D.
Holy Tradition is also witnessed to by the decisions of the Ecumenical Councils, the Nicene Creed, the writings of the Fathers of the Church, by the liturgical worship and iconography of the Church, and in the lives of the Saints. The Christian Church learned to worship in the Jewish Temple and in the Synagogues. Again and again the New Testament tells us that Jesus, Paul and the others worshipped regularly in Jewish houses of worship. (See for instance Luke 4:16; Acts 3:1; Acts 17:1-2.) We know from archaeology, and from modern Jewish practice, that Synagogue worship was and is highly liturgical, i.e., communal, organized, ceremonial, and done decently and in order (I Corinthians 14:40). Many Biblical scholars have shown, very convincingly, that when John describes heavenly worship in the book of Revelation, he is following the Hebrew custom of portraying Heaven’s worship in terms of earthly liturgy. The writers of the Bible thought of earthly worship as a “shadow” or “type” of Heaven’s liturgy. (See Isaiah 6, Hebrews 8:4-6.) In other words, a biblical passage such as the fourth and fifth chapters of the Book of Revelation gives us an accurate picture of a very early Christian worship service. That service very much resembles traditional Orthodox worship. If you are interested in knowing more about the historical origin of Orthodox worship, look here. Holy Tradition as a set of basic principles outlining our worldview is a constant. Its very constancy, however, sometimes will even demand change. As a simple instance of this, by Tradition our worship is to be celebrated in a language understood by the worshipping congregation. This means that Tradition, not infrequently, requires a change in liturgical language. As another instance, the Tradition also requires constant change in ourselves as, through the guidance of the Holy Spirit, we grow spiritually and respond ever more fully to the call of God in Jesus Christ. Holy Tradition has been defined as “the life of the Church in the Holy Spirit.” As such it is dynamic and adapting, while at the same time always remaining the same Divine life. The life of the Church does not change to satisfy our whims and personal preferences. It is there to change us, and to bring healing to our tarnished soul. There are points of contact between Orthodox and Roman Catholic belief on these issues, and modern Roman Catholic practice. After all, we shared more or less a thousand years of history. But there are also significant differences. To discuss them in depth is beyond the scope of this short summary. The following is a brief statement of the Orthodox point of view. We likewise honor the other great men and women in the life and history of the Church – patriarchs, prophets, apostles, preachers, evangelists, martyrs, confessors and ascetics – who committed their lives so completely to the Lord, as models of what it means to be fully and deeply Christian. These men and women are called “saints”; a word deriving from the ancient Latin word meaning “holy.” For example, we believe that men like the apostle Paul – in their devotion to Christ – led holy lives and that we are indeed to be imitators of him, as he was of Christ. As indicated in John 20:21-23, and James 5:14-16, we practice sacramental confession and absolution of sins. The presbyter (priest) is the sacramental agent of Christ (as were the Apostles) and the witness of the confession. The priest sacramentally conveys Christ’s forgiveness, not his own. In the Orthodox Church therefore, to receive Holy Communion, or any other Sacrament (Mystery), is taken to be a declaration of total commitment to the Orthodox Faith. While we warmly welcome visitors to our services, it is understood that only those communicant members of the Orthodox Church who are prepared by recent confession, prayer and fasting will approach the Holy Mysteries. Why do you have all those paintings in your church? Icons are not paintings in the sense of naturalistic representations. They are rather stylized and symbolic expressions of deified humanity. (See II Peter 1:4; I John 3:2.) For the Orthodox, icons are sacramental signs of God’s “Cloud of Witnesses” (Hebrews 12:1). We do not worship icons. Rather, we experience icons as Windows into Heaven. Like the Bible, icons are earthly points of contact with transcendent Reality. In the original Greek of the New Testament, Christ is frequently called the icon (image) of God the Father. (See II Corinthians 4:4; Colossians 1:15; Hebrews 1:3.) Man himself was originally created to be the icon of God (Genesis 1:27). You can read more about the use of icons in the Church here. We believe that God quite literally does exist. He is not a figment of pious fiction or wishful thinking. God and His will is therefore our “top priority.” We believe that the Word of God literally became Incarnate as Jesus of Nazareth. We believe the Lord Jesus literally rose from the dead in a real though transfigured and glorified physical body. We also believe that life apart from God is hollow and meaningless. Being “relevant” should not be our concern – being holy should be. However, it is our experience that our sacred Liturgy, the ancient Christian teaching about God and the meaning of human life, are just as relevant today as yesterday. These define our basic values. We know the whole ancient Christian Faith as that which makes more sense than anything else in this world of constant change, confusion and conflict. And we know from the experience of the Saints that the services and the mystical life of the Church brings healing to the depth of the human soul. We believe that the purpose of human life is for man to become partakers of the divine nature through the grace of the Holy Spirit; in prayer (both at home and in Church), sacrament, reading the Scriptures, fasting, self-discipline, and active love for others. All other human projects and purposes, however noble and important, remain secondary to that which gives ultimate meaning to our human existence. This brief outline of Orthodox Faith necessarily only touches upon a number of more involved issues. If you would like to find out more, we would welcome your inquiries. Please contact our priest, Fr. Andreas. There are some 250 million Orthodox Christians in the world. Most Christians in Greece, Romania, Bulgaria and Serbia, Russia and Ukraine are Orthodox. According to the Encyclopedia Britannica, the number of Orthodox Christians in the United States grew by 5.8% a year from 1990-1995, making Orthodoxy proportionally the fastest growing faith in America. In the years 2005-2010 the attendance growth in Orthodox churches increased by 18%! The heaviest concentrations of Orthodox in America are in Alaska, Pennsylvania, New Jersey, New York, and Ohio. Organized Orthodox Church life first came to America in 1794 with missionaries from Russia who came to Alaska. Centuries of vigorous Orthodox missionary activity across 12 times zones in northern Europe and Asia was halted by the Communists after the Soviet Revolution in 1917. Orthodox missions are increasingly active worldwide, notably in Central Africa, Japan, Korea and many other parts of the world. The text above is an adaptation from Fr. Steven Tsichlis at St. Paul’s Greek Orthodox Church.